We’ve seen a bunch of behind the scenes photos from the Massachusetts-based set of Paul Feig’s upcoming Ghostbusters, including some candid shots of the core cast. But as his been his pattern, Feig just took to social media to give us our best look at them yet, tooled up for battle, posed in front of Ecto-1, and looking badass. From left to right in this photo that appeared on Feig’s Twitter feed, you’ve got Leslie Jones, Melissa McCarthy, Kristen Wiig, and Kate McKinnon. With their proton packs strapped to their backs and their customized ride in the background, not to mention their hard stares, they’re definitely throwing off a don’t mess with us vibe. 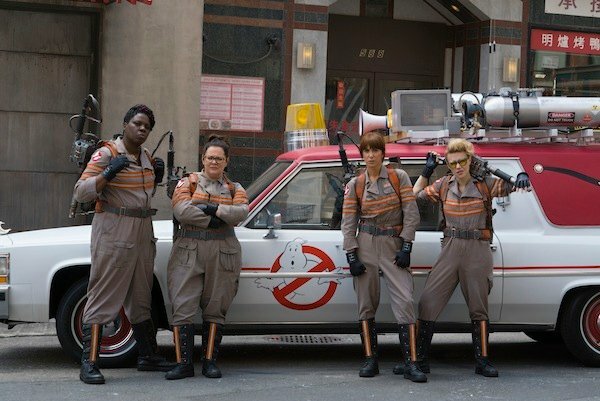 Feig has gone on record as saying he envisions this new generation of female Ghostbusters as "paranormal warriors," and they certainly look the part in this new image. You don’t get the impression that you want to cross these four, though you can bet once they get down to business, there will be plenty of laughs to go around. We are talking about some of the funniest people currently working in film after all. Also, I knew Leslie Jones was very tall, but damn, she towers over the other three. With filming under way, this week has seen a number of new additions to the cast. Chris Hemsworth joined a while back as the receptionist, stepping into Annie Potts’ sizeable shoes, but in the last few days Andy Garcia, Michael Kenneth Williams, Matt Walsh, and Cecily Strong all officially showed up at the party. They’ve even now cast the main villain, Rowan, to be played by Neil Casey, though we’re still not sure if he’s a spirit villain or a human antagonist. As far as the plot goes, we’ve heard that Melissa McCarthy and Kristen Wiig’s characters are friends who write a book about ghosts and how they are real and living among us. It goes generally under the radar, at least until Wiig lands a job at Columbia University. When her colleagues discover her earlier work, she’s basically laughed out of the Ivy League halls, only to reunite with McCarthy, Leslie Jones, and Kate McKinnon for some paranormal investigation. Feig has said that he’s interested in exploring what would happen with this in the modern world. We see all kinds of ghost shows on TV, and they’re all crap, so he wanted to see how people would react if all of these things started to become a reality. That’s why, as much as he loves the original film, he didn’t just want to do another sequel and wanted to tell an origin story.